On the first day of October I load the dog into the car, along with a tennis ball, two empty plastic tubs and a three-pronged hand rake. Today marks the seasonal re-opening of the town’s beaches to dogs, from now on through March. So to the sea we go. The dog likes nothing more than to chase a tennis ball across the soft wet sand into the shallow planes of saltwater at low tide. He stops to sniff out all the mysterious scents of the seashore and on occasion to bury his catch in a hole dug along the tidal flat. I stop at the strandline to fill the buckets with seaweed to ferry home to my pile. The timing is doubly good: After weeks of dry weather, a coming storm system is set to bring rain to the parched region. Bolstered by a harvest moon, the flood tides have washed up a deep, ragged etching of seaweed and other bounty of the sea. After giving the dog his run along the beach, I fill the first bucket with a pungent mix of drying seaweed and broken stalks of seagrass. The sand-flecked scrapings are suffused with sea shells, the carapaces and claws of crabs and stray flight feathers, mostly the gray and white quills of seagulls. It weighs about 40 pounds, I figure as it bangs against my hip on the way back to the car. It is ripe enough that I know I will drive home with the windows wide open, the dog’s safety be damned. Such a batch of seaweed and organic flotsam is a prized addition to my pile, especially at this time of year. I will spread it across the base, which has begun this season first with a rough and tangly layer of spent flower stems and uprooted vines and plants from the garden. 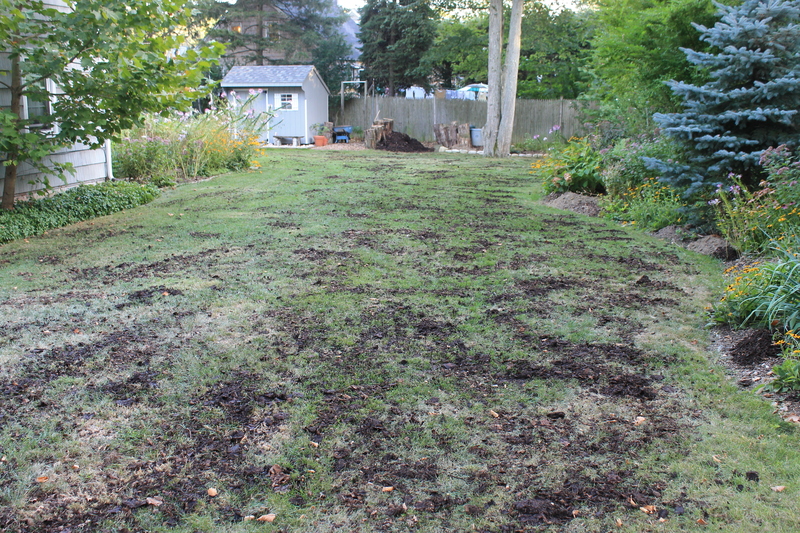 I’ve since added a heaping of fresh-cut grass clippings, thick with the rich detritus from when I mowed over the compost cast across the yard. 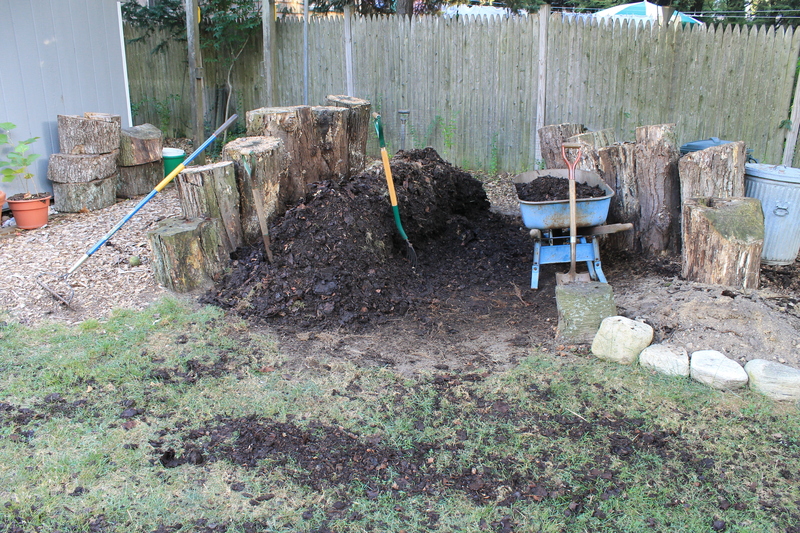 My goal is to give my pile a rich, green base of highly biodegradable greens before I begin to raise it up out of the ground with load after load of gathered brown leaves. 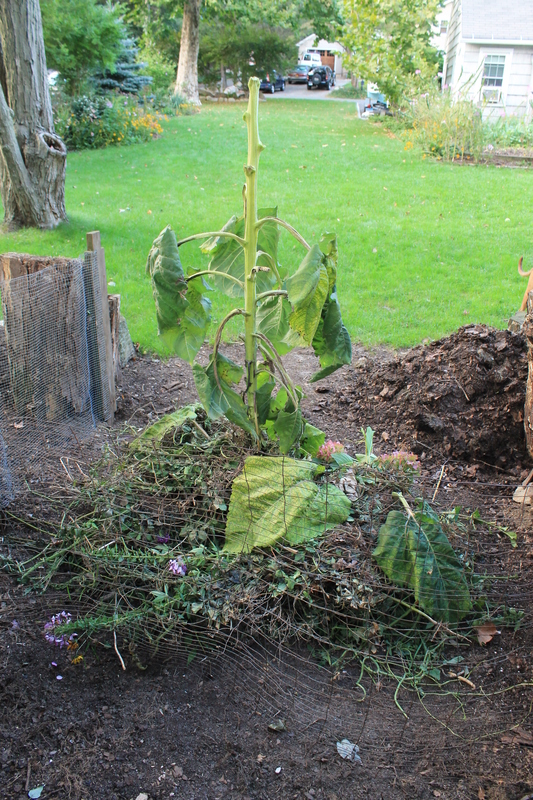 A compost heap too bottom-heavy with leaves risks becoming a dead zone. The leaves compress and entomb themselves, sealed off from air, water and other agents of change, among them me and my pitchfork. Set on a veritable platter of rich, airy green material, the autumn leaves, I hope, will begin to decompose from below, and the resulting heat and biological activity will filter upward as I continue to layer my pile with fresh additions of all manner of rottable organic material on through the fall and winter months. My pile’s ‘sea floor’ — a rich, briny mix of seaweed and seagrass, infused with sea shells, crab claws and cast-off feathers of seagulls. The longer I live by the shore of the Long Island Sound, the more I come to respect its riches. And the more I realize that the Sound I know is a shadow of what it once was. Its productivity was once legend. In the foreward to Tom Andersen’s “This Fine Piece of Water: An Environmental History of Long Island Sound,” Robert F. Kennedy Jr. writes “how Henry Hudson’s lieutenant Robert Juett described rivers choked with salmon (probably striped bass) and mullet … New Yorkers ate more oysters from the Sound than any other meat, including the East River oyster, now extinct, whose eleven-inch shell housed seven pounds of succulent flesh. Over the next century, the Sound’s natural resources were methodically plundered; first beaver and other riverine mammals for their pelts, then deer and larger prey, then seals, then whales, then passenger pigeons and turkeys, once so numerous and unguileful that hunters, Andersen writes, would park a wagon under a tree where turkeys roosted and shoot them all but take only those that dropped directly into the buckboard. Since then, especially after a disastrous algae bloom in the late 1980s, the Sound has struggled to recover even the barest scraps of its once seemingly endless bounty. Andersen paints a vivid picture of the Sound’s low point, the summer of 1987. An unprecedentedly large algae bloom led to a collapse of oxygen levels. “Hypoxia in the Sound’s center trough spread up and out toward the shoals, linking up with hypoxia in the harbors. Pockets of healthy water that could have provided refuge for fish and lobsters vanished. Blackfish breached the surface, gasping pitifully for air. Since those dark days, the Sound has recovered, somewhat. Though the lobster – once so plentiful that inmates in New England prisons rioted at being served an endless supply – will never return to the now cleaner but ever-warmer waters, the summer of 2015 saw the first sightings of whales in the Sound in generations; porpoises and seals are also making appearances, lured from the ocean waters off Cape Cod by growing numbers of baitfish, mostly the oil-rich menhaden. Oyster farms are a growth industry, recreational fishing is robust and tightly regulated; beach closings are less common. That stinky fish is “menhaden, also known as bunker, or pogies,” Schiffman continues. To the fishermen he spoke to, “there are encouraging signs that the menhaden population along the Atlantic Coast is healthy after decades of intensive commercial exploitation. “The name menhaden is a corruption of “munnawhatteaug,” which means fertilizer in Algonquian. Native Americans taught the pilgrims to plant them with their corn, enabling colonists to coax a crop from rocky New England soils, according to Bruce Franklin, author of “The Most Important Fish in the Sea.” Manhaden was used as a lubricant, replacing whale oil after the Civil War; today the most of the catch (the largest by weight in the East Coast fishery) is rendered into heart-healthy omega-3 fatty acid fish oil, as well as used to produce fertilizers and high-protein feeds for livestock, reports Schiffman. Just 15,000 years old, and formed by glaciers that scoured the land to the north and left it piled up in ridges to form Long Island, the Sound is a current event, at least in geologic time. It is also one of the globe’s the most dynamic waterscapes, and may be able to recover further, if we let it. Flushed twice daily by the tides, it features “a greater range of seasonal temperatures than that of any other body of water in the world,” says Tom Andersen, with temperature as low as 32 degrees in winter and as high as 76 in August. The dog days of summer aside, the dog swims year-round, whether it’s to paddle through the 70-degree surf on the first day of October or a plunge into the icy water of February. He doesn’t know what he’s missing, in terms of the bounty that once lapped upon the shores he trods. And though its riches now pale in comparison to generations past, the Sound provides me and my pile with more than I can use. I wonder if other backyard gardeners or lcoal farmers reap the sea’s harvest like I do, or if the surplus seaweed raked from the region’s public beaches to keep beachgoers happy is recycled in any productive way. “The best fertilizer in the world,” says Bull in the Irish film The Field. Seems a shame to let all that seaweed rot on the beach when it could be put to use renovating nearby landscapes that have been degraded over the years by the careless hand of man just as much as the provident local sea. My pile typically begins each fall with a “sea floor” of seaweed, shells and crab carapaces culled from the strandline of the nearby beach. The first weekend day of fall begins like yet another morning from the summer just past – warm, dry and sunny. Though the weather may be stuck in a holding pattern –a pleasant one at that – there are chores to be done in the backyard, garden and compost pile. The dog likes nothing better than the sight of me on the back porch lacing up my work shoes. I feel the same way. My main Saturday chore is to mow the lawn. After aerating and overseeding three weeks ago, I’ve since watered plenty in the absence of any significant amount of rain. The grass has grown long and tangly, and at last a storm is forecast to head up the Atlantic Seaboard by mid-week. 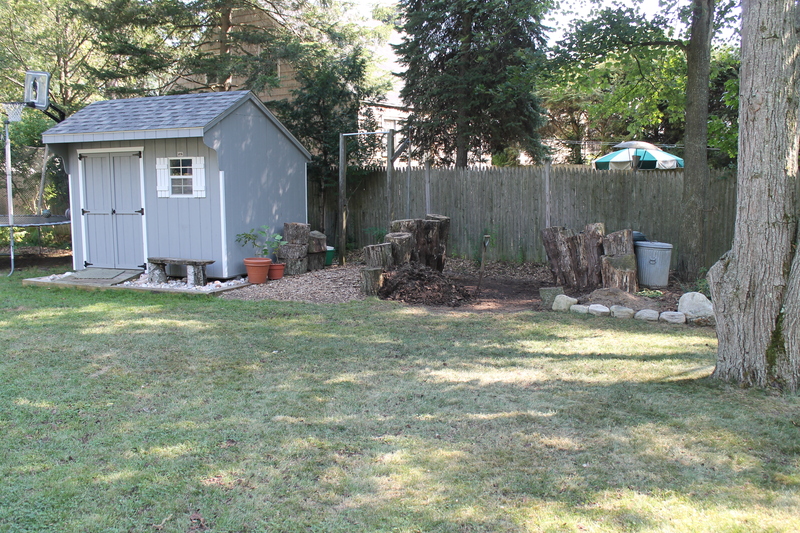 While I wait for the morning dew to dry, I busy myself finishing up some procrastinated gardening chores, which in my Connecticut backyard means moving rocks. Over the course of season of aerating, weeding, transplanting and pruning, I’ve unearthed a load of new stones to repurpose and also exposed some needed hardscape repairs. First I reset and enlarge the rock pathway along the side of my house that leads to the water hose and garbage can. 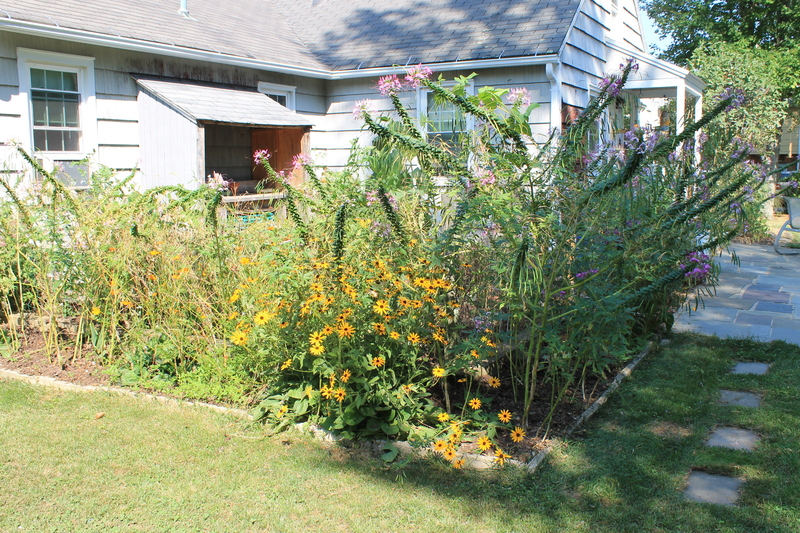 Nothing against gardeners who busy themselves with annual plantings, but I tend to focus on the “bones” of my property. Like any gardener or otherwise domesticated housekeeper, taking out the trash or watering the plants is a most utilitarian area, which deserves upkeep and the occasional facelift. 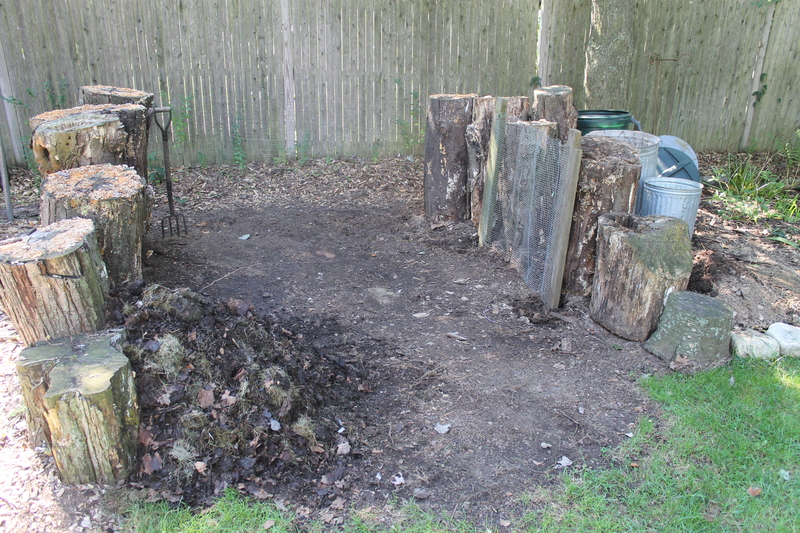 Now’s the time to do it before the leaves fall, my pile fills up and the ground freezes rock-solid. Having already cleared the approach of encroaching pachysandra, I haul a few pieces of flat scheist from the stack of unearthed rubble rock I keep in a corner of the yard. I figure the flat, grainy stone chunks cleaved off eons ago from the glacial-scrubbed ridge that stretches behind the homes across the street. Or they may be from loose fill trucked in in the early 1950s to build up this marshy lowland onion field into a building lot on an old valley road. Whatever their provenance, they have a new setting as I plant them in a mix of sand, compost and topsoil. I’ll now have a clear and easy path to take when I haul out the garbage on a dark winter’s night. 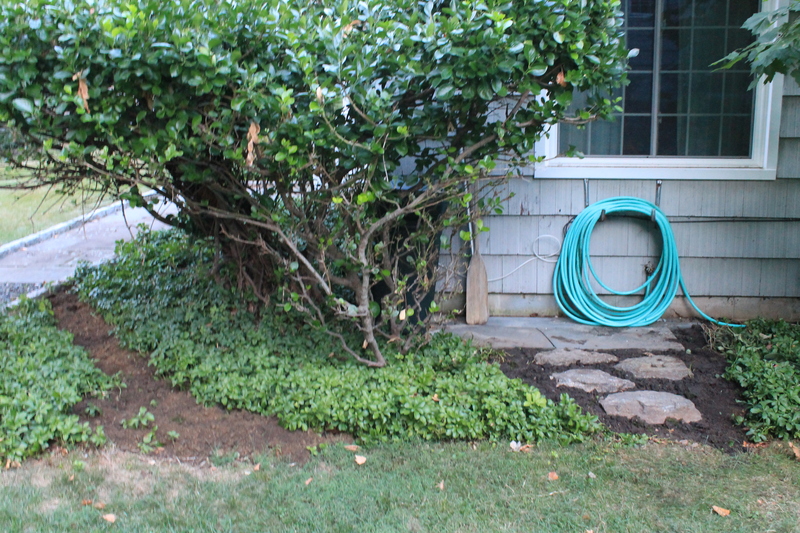 Compost helps fill in around the stone steps leading to the water hose and garbage can, as well as the track the dog has made through the pachysandra. Another garden task, one that I hope will pay dividends over the long haul: Along one side of my property is a swath of privet bushes, long grown tall as small trees. I’ve kept them largely untended as a screen to my side neighbor’s house, which is just a few feet beyond the fence that divides our properties. An introduces species of an semi-evergreen shrub found throughout Asia, privet has long become an American landscape fixture, defining Southhamption estate and suburban backyard alike. I admire how it has set down such deep American roots. Each summer the privets’ fast-growing limbs hang heavy with white flowers, which in turn produce heavy boughs of purple berries late in the winter that the early-arriving robins gorge on while they’re waiting for the yard to thaw and give rise to the earthworms they seek most of all. The berries the birds don’t pick ultimately drop down into the thick bed of rotting wood chips and compost mulch. Just as well; I read that with certain types of privet, the berries are mildly toxic to humans, though the Chinese have long used privet bark and leaves in herbal medicine as cures for everything from chapped lips to chronic bowl problems. The fast-growing branches I prune each year make privet a great green security fence; the flexible, reedy twigs are also used as cords for lashing in other cultures, which is why I don’t turn the branchy clippings into my pile but instead haul them off to the local yard-refuse center for recycling. In any event, each year I get a crop of vigorous weedlings of the profilgate privet, which I pluck out of the ground with a dandelion digger and transplant along the back side of my property. Soon after moving in a decade ago, I had a wooden stockade fence set in place along the rough, shady line of trees and bushes that separate the edge of my backyard and the neighbor’s house, just two or three paces beyond. 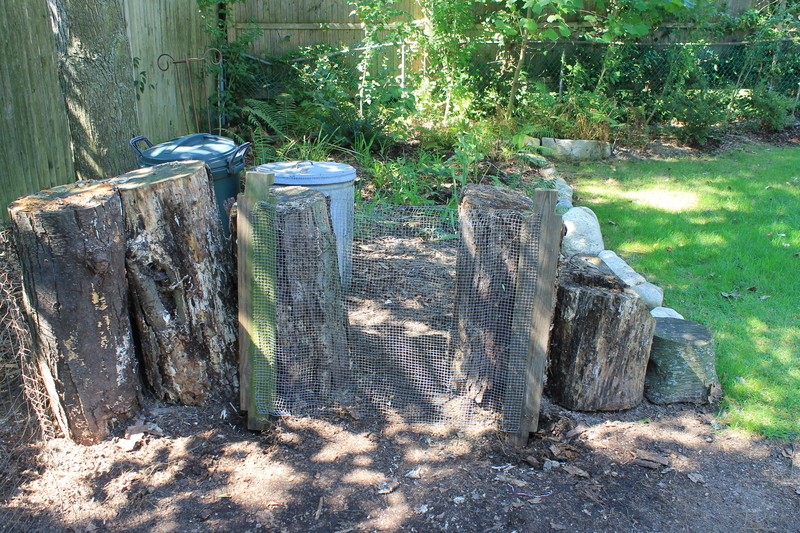 Knowing that the wooden fence will last only a few more years before rotting away in the damp shade, at its base I’ve begun to create what I hope will be a new, living screen of privet. It’s the sort of silly little backyard project that I think most avid gardeners will recognize: A good-faith effort to make use of a garden material in abundant supply – in my case, spindly little privet sproutings – in hopes that over the years the effort will pay off in a useful garden fixture – a dense screen of living green. 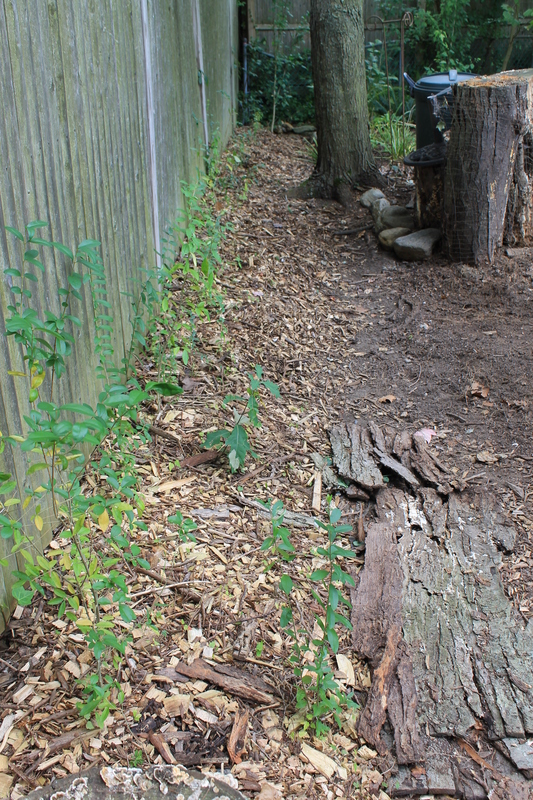 Over the past few seasons, I’ve dug up as many small privet plants as I can find that have sprouted in the mulch of the perennial flower garden, to transplant the bare-root striplings alongside their earlier kin in the deep bed of wood chips I’ve long piled up against the fenceline. I water the spindly little invasives into bare spots up and down the budding hedgerow. Privet being as hardy as it is unappetizing to deer, I know most will take root and survive –but whether they grow thick enough to become a living replacement for the rotting stockade fence will probably be for the next homeowner to decide. The puny privet hedge taking root in the wood-chip mulch and shade along the stockade fence that bounds the backyard and my pile. And that’s the thing about tending a suburban property. Yes, I own the house and its grounds, or at least share ownership with the mortgage lender. But I am fully aware that I am only a temporary caretaker, at least in the timeframe that nature keeps. My backyard, and at the heart of it, my compost pile, is a hobby farm of very modest proportions – not much more than a third of an acre. 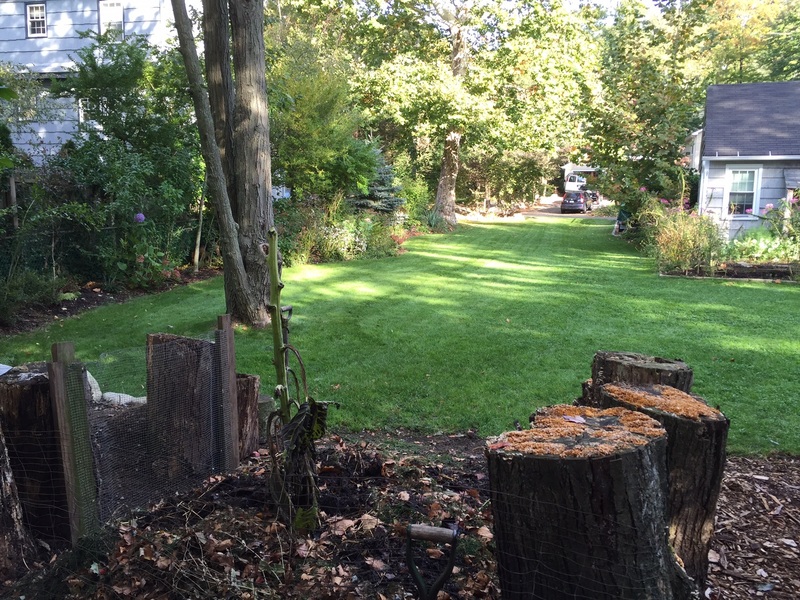 I’ve designed and keep up the yard according to my wants and whims, to be a playground and refuge for me and my son, a robust habitat for native flora and fauna, a family footprint of carbon and other essentials that is sustainable and livable. My goal is to give my yard the best bones I can, for the larger and greater sense, I’m just a short-term tenant of my property, which I intend to leave in better shape than I found it. 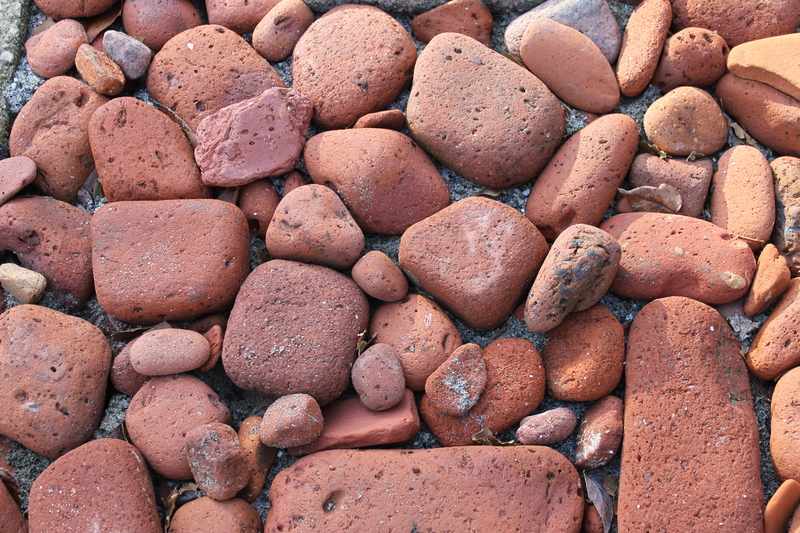 Another homeowner could, and probably will, change the property as much as I have – the stones I set in place are steps that are fleeting even for me. I can only hope that the hardwoods that I’ve nurtured, the oak and beech and hickory, will grow tall enough before I leave to be lasting replacements for the swamp maples and other trash trees I inherited. 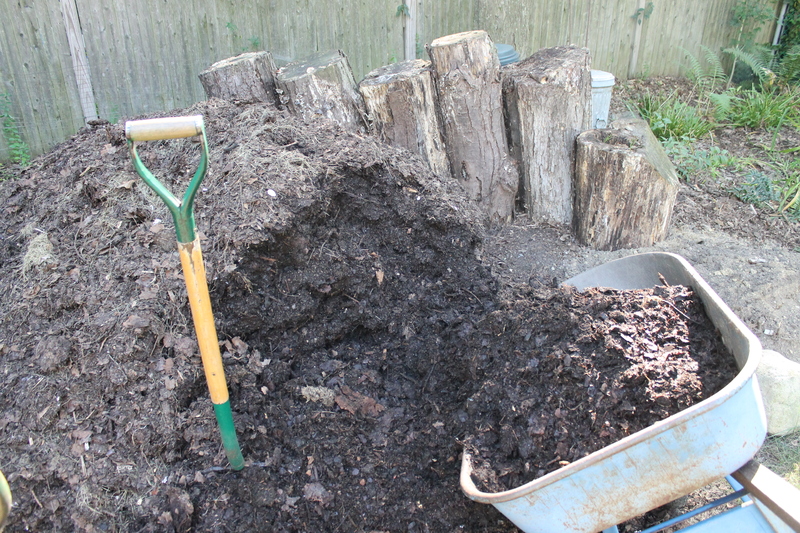 The backyard I tend is a long way from achieving any sort of Permaculture status, but what my pile has contributed to it over the past decade, the tonnage of new compost, rich in carbon and nutrients it’s added, will pay dividends for decades. Setting stone pathways, pruning bushes, raking leaves and mowing the lawn may seem like jobs to outsource and then cut a check for. The price of being a homeowner, I guess. But not me. I can’t wait to haul the mower out of the shed. Even better, when I pull the grass catcher from its hinge, to remove the duct tape I’d used a month ago to seal it, I find the slanted bag half full. 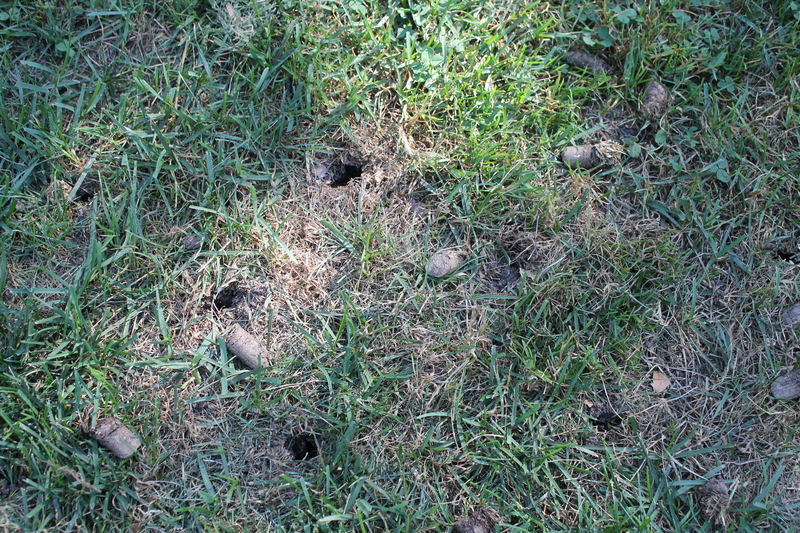 Inside are the dusty remains of my mowing in the compost over the lawn a week ago. I can’t think of a better addition to my nascent pile than a batch of highly sifted mature compost and dried grass clippings. 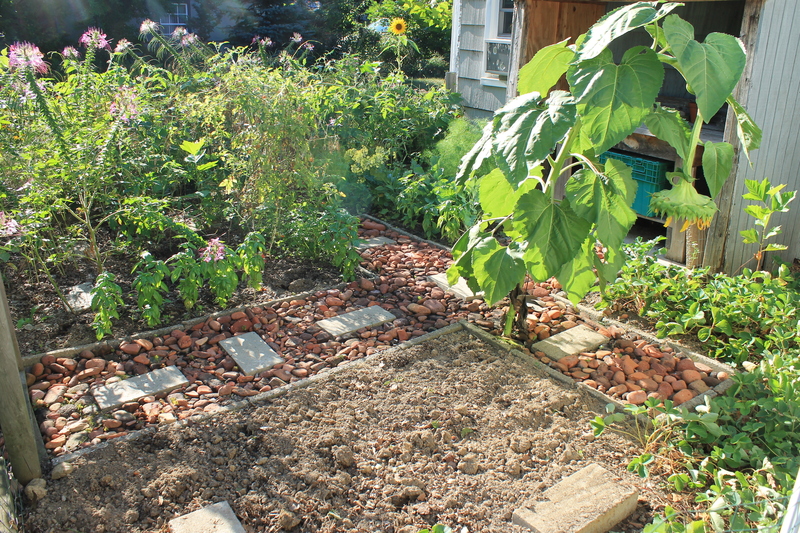 I empty the bag atop the tangled limbs of tomatoes and spent stalks of herbs and flowers, shoring up the stout sunflower stem that rises from the very base of my brand-new pile. I tear off the ragged strips of duct tape from the mower’s open end, set the blade up a notch and fire up the Toro. 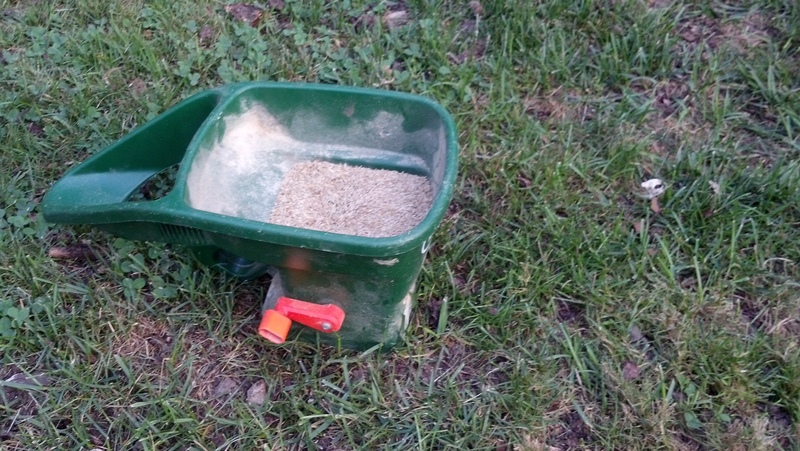 I start under the sycamore tree, which has already dropped a dappling of leaves, and quickly fill the grass catcher. 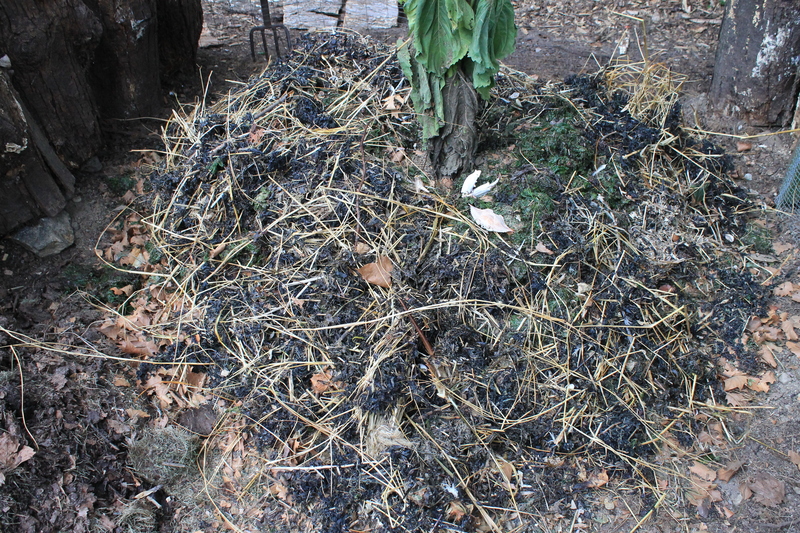 I pour the mix of chopped leaves and fresh blades of grass over my pile. I’m starting my pile off with a base of chopped up grass clippings and leaves. 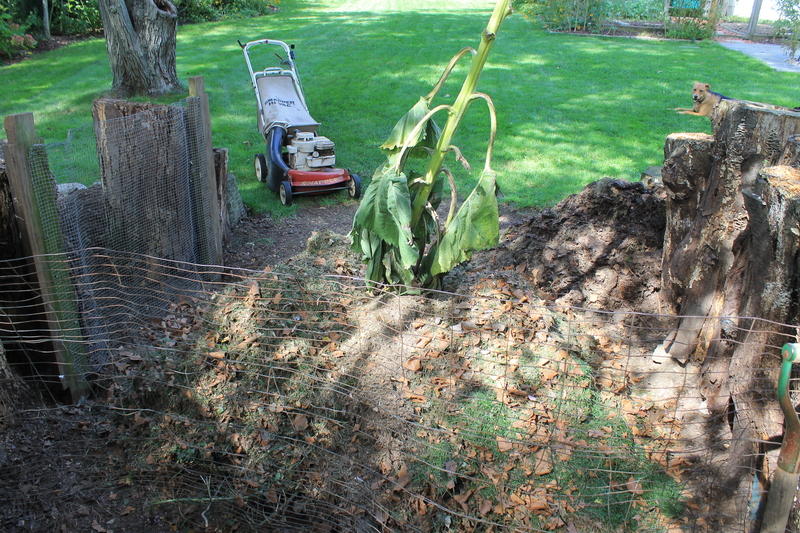 In all, I add three more catchers’ worth of fricasseed leaves and grass to the base of my pile, and leave as least as much to the yard. The verdant patches of green make great, pocket-sized playing fields for my son and dog, the neighbors and me. But the thick grass lawn also yields its own surplus crop of nutrient-rich material that I am happy to harvest. You don’t have to own a 40-ft. wide combine to feel like a farmer. Sometimes a 2-ft. wide Toro will do. It’s a good start to my pile, and to the fall.